Barcelona continue to maintain their hope in chasing the 10 points gap with Real Madrid after beating Atletico Madrid 2-1 in Vincente Calderon, but apparently the success didn’t make the Catalan side’s tactician, Josep Guardiola getting more confident. After the match, Guardiola revealed to the press that the win doesn’t increase Barca’s chance in leapfrogging Madrid for the La Liga title, as the tactician even think that his team are unlikely to be retaining their crown this season. Despite admitting that the title might be getting further away from their reach, Guardiola promised the fans that the Catalan side will keep on trying to chase their rival until things are eventually decided. The tactician seemed trying to keep away the tension from his team as they definitely looked under pressure against Atletico, a situation which could eventually forced them to slip some more points in the upcoming matches. I don’t think we will win the league, but we will fight until the end. 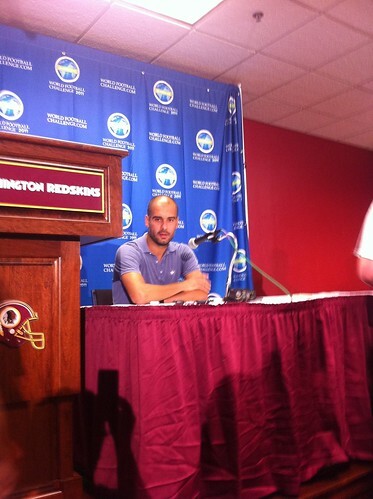 We have passed a difficult test against a very tough opponent [in Atletico],” Guardiola added. Aside commenting about his team’s chances in La Liga, Guardiola didn’t forgot to praise his Argentinian superstar, Lionel Messi, who once again inspired Barcelona into victory with his lovely free kick and also involvement in the first goal scored by Dani Alves. The Spanish tactician hailed Messi as a leader who proved his worth many times on the pitch, deciding the game for his side in more than just one or two occassions. A leader is he who steps forward when his team needs him and Leo [Messi] has been doing that for four years,” Guadiola said. It would be very interesting to see whether Barcelona players will be more calmer, motivated or simply losing their interest in the next few matches in La Liga, considering Guardiola openly admitted the chance for retaining the La Liga is getting smaller each weekend. Of course the chance for the Catalan side remains open but with the Los Blancos’ constant abilities to grab results against every other team in the league, things obviously doesn’t look promising for El Barca.